Each colourful tile is surrounded by magnets along their edges, which lets you stick them together to create awesome structures. They are truly magic! No matter how you stick them they just seem to, well, stick. Which makes it easy for anyone. Even for Seb. And it is a pretty satisfying feeling when they "click" together. 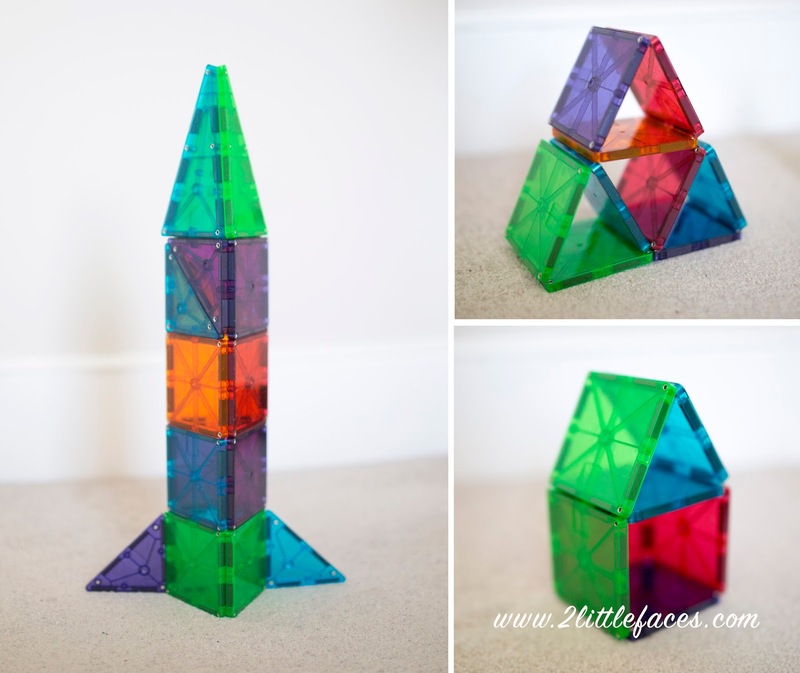 Not only are Magna-Tiles fun, they are educational! 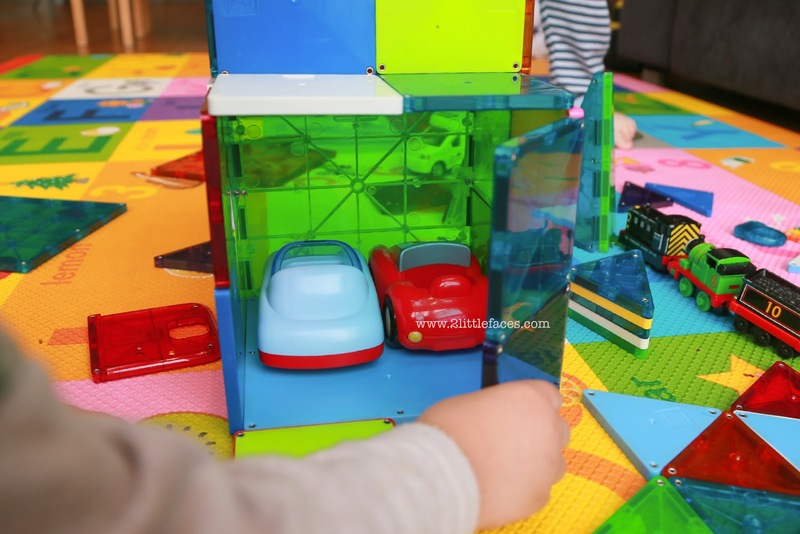 They teach spatial awareness, math, logic, and problem-solving through play. "Where math, science, and creativity meet"
The boys love them and it makes a great break from playing with just cars and trains every day. There are so many ways to play with these tiles. 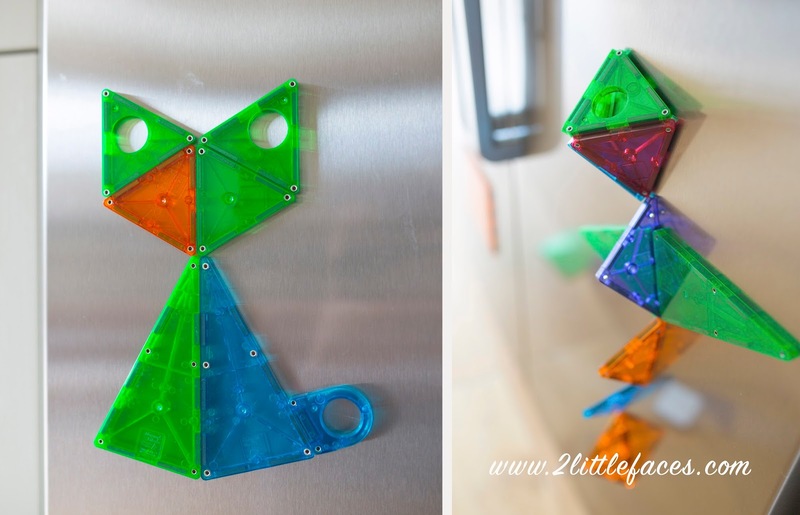 You can find ideas all over Pinterest and the Magna-Tile blog where your little one can become a Magna-Tect. Magna-Tiles are on the expensive side. But totally worth it as I can see years of fun with these. We just need to buy more. I got mine from Amazon. We have the 48 piece set (£59.99*) as it had the wheeled chassis and other different shaped pieces and the 32 piece, solid colour, set (£39.99*) as it was free in a special promotion. *Prices were correct at time of post. In total we have 80 pieces. It is worth while to get the 100 piece set. And if you know someone in the USA (Hi Dana!) who can get them for you even better as they are cheaper. 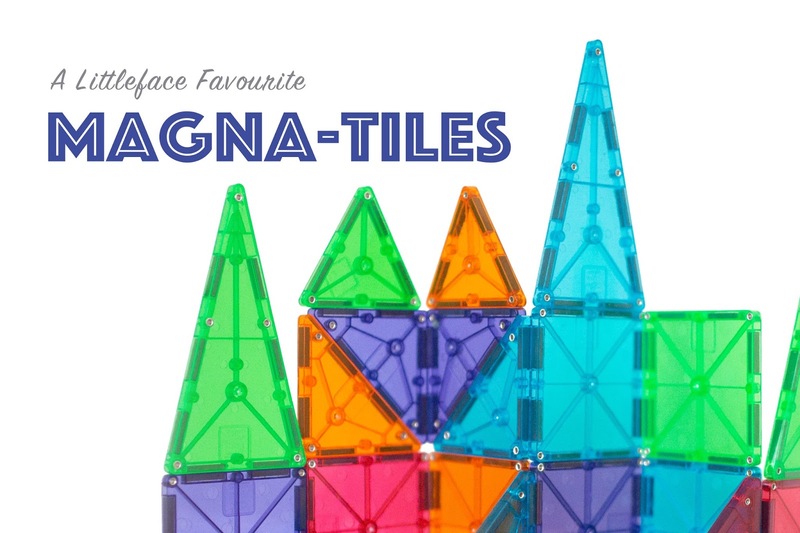 Online at www.magnatiles.com or in participating stores. There are other brands out there which are cheaper but when reading reviews on them, there seemed to be complaints about quality and the lack of strength in the magnets, so I stayed away from them. I think Magna-Tiles are great for boys and girls of all ages. And it is something Harvey and Seb can play with together. I am sure as the boys get older they will be building more elaborate structures. I'd never thought of putting them on the fridge before. Brilliant!